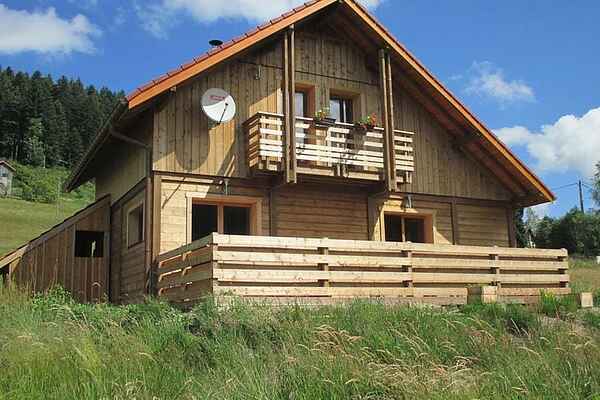 A wonderful, large and comfortable Finnish chalet in an environment brimming with natural beauty! Made from the round wooden beams typical of these Finnish chalets. You will have access to a pretty lawn at the front, featuring several apple trees. Further along, the garden turns into a forest and mountains, creating a beautiful view. It is located in a quiet district approximately 2 km from Rochesson. In the centre of the Parc Naturel Régional des Ballons des Vosges, the land of the rounded mountaintops. In the versatile town of Gérardmer (7 km), you can find a large recreational lake in which you can take boating trips and go paddle boating. You'll also find a small beach and promenade there. Gérardmer also features a swimming pool, tennis court, mountain bike rental, shops, a supermarket and a lovely market on Thursdays and Saturdays. A bakery and grocery store can be found in Rochesson (2 km). Marked walking and cycling routes take you along the most beautiful regions of the Vosges. The routes take you along the Roche du Diable (20 km) and the Col de la Schlucht (26 km). Take the kids for some bob sleighing, the more summery versions of snow sleighing. Sure to be a hit. The wonderful city of Colmar (73 km) is also worth a visit.